Strawberry is an important commodity in California with a crop value of $2 billion (NASS, 2013). Lygus bug or western tarnished plant bug (Lygus hesperus), twospotted spider mite (Tetranychus urticae), greenhouse whitefly (Trialeurodes vaporariorum), and western flower thrips (Frankliniella occidentalis) are considered as important arthropod pests of strawberries which can cause significant yield losses. According to the Pesticide Use Report of California Department of Pesticide Regulation (2014), more than 200,000 lb of chemical insecticide and miticide active ingredients were used in strawberries in 2012. Among the 50,000 lb of biorational active ingredients that were additionally applied, 97% were Bacillus thuringiensis products used against lepidopteran pests. Apart from the release of various species of predatory mites against twospotted spider mites, pest management in strawberries is mainly dependent on chemical pesticides and IPM is generally limited to the rotation of pesticides in different modes of action groups. In an effort to develop an effective IPM program with a particular emphasis on lygus bug management, research has been conducted for the past few years in Santa Maria to evaluate the role of various non-chemical alternatives. Field studies in 2013 showed that botanical and microbial pesticides can be effectively used in combination and rotation with chemical pesticides (Dara, 2014). Additional studies were conducted in 2014 to evaluate the efficacy of various combinations and rotations of new and existing chemical pesticides along with botanical, earth-based, and microbial pesticides. A large scale field study was conducted during June and July, 2014 in a conventional strawberry field of variety Del Rey at Goodwin Berry Farms, Santa Maria. Chemical pesticides included those from IRAC mode of action groups 3A (sodium channel modulators) 4A (neonicotinoids), 4C (sulfoximines), 6 (chloride channel activators), 9C (selective homopteran feeding blockers), and 15 (inhibitors of chitin biosynthesis). Additionally, diatomaceous earth, azadirachtin, and two entomopathogenic fungi, Beauveria bassiana and Metarhizium brunneum (formerly known as M. anisopliae) were also used. Diatomaceous earth is a powder form of fossilized remains of diatoms and contains silicon dioxide as an active ingredient. Silicon dioxide interferes with the integrity of the cuticle by absorbing the waxy layer and causes mortality due to desiccation. Both B. bassiana and M. brunneum are soilborne entomopathogenic fungi which cause infection when a conidiospore comes in contact with an insect or a mite. Azadirachtin, a secondary metabolite present in neem seed, is a limonoid compound which interferes with the synthesis of various proteins and thus affects molting, mating, sexual communication, and reproductive ability. It also has insecticidal properties and acts as an antifeedant and repellent. Using these alternatives can help pest management which is sometimes difficult to achieve with chemical pesticides alone. 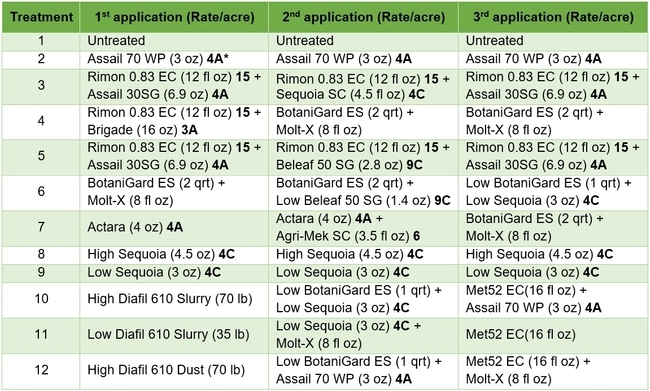 Treatments included an untreated control, a wettable powder formulation of acetamiprid as the grower standard, and other materials in different combinations and rotations (Tables 1 and 2). Each plot had seven 75' long and 64” wide beds and treatments were replicated four times in a randomized complete block design. Treatments were administered late afternoon or in the evening using a tractor-mounted sprayer except for diatomaceous earth dust which was applied by a backpack dust applicator. Three applications were made at 7-8 day intervals and observations were made once before the first application and 5-6 days after each application. On each observation date, 20 plants were randomly sampled from the middle three beds of each plot by gently beating the plant to dislodge insects into a container. The number of aphids, lygus bugs (young and mature nymphs and adults), thrips, whitefly adults, and various species of natural enemies were counted from each plant. Natural enemy complex included bigeyed bug (Geocoris spp. ), minute pirate bug (Orius spp. ), lacewing (Chrysoperla spp. and Chrysopa spp. ), damsel bug (Nabis spp. ), lady beetle (multiple species), parasitoids (multiple species), and spiders (multiple species). Data were analyzed using statistical procedures. *3A Sodium channel modulators 4A Neonecotinoids, 4C Sulfoxamines, 6 Chloride channel activators, 9C Selective homopteran feeding blockers, and 15 Inhibitors of chitin biosynthesis. Actual numbers of various pests and natural enemies are presented in Table 3 and percent change post-treatment compared to pre-treatment is presented in different figures. Table 3. 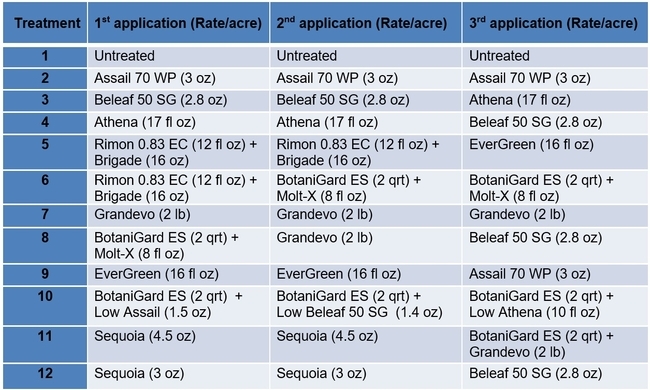 Pest and natural enemy populations from various treatments before and after treatment per 20 sample plants. Post-treatment counts include averages for three spray applications. Refer to Tables 1 and 2 for the list of treatments. Aphid: Negligible number of aphids was seen only in few treatments and data are not presented. 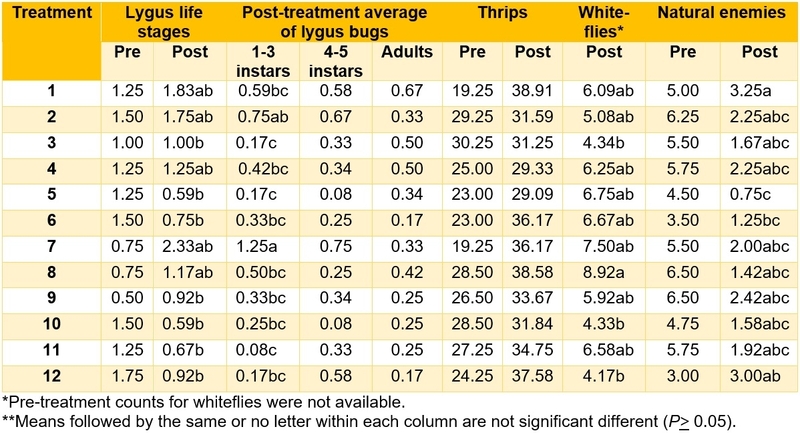 Lygus bug: Lygus numbers increased in all treatments after treatment and there were no statistical differences (P > 0.05). However, when the percent change, compared to pre-treatment counts, was considered, some treatments appeared to be more effective than others in preventing population buildup. 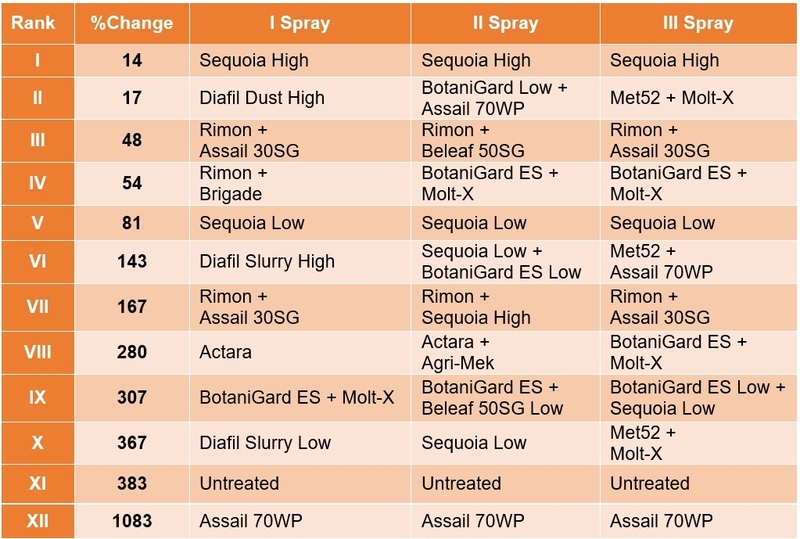 The high rate of Sequoia (treatment 8) limited the increase to 14% followed by the rotation of Diafil high rate-BotaniGard low rate+Assail 70 WP-Met 52+Molt-X (treatment 12) indicating the potential of non-chemical alternatives for lygus bug management (Table 4). When BotaniGard+Molt-X combination was applied twice after Rimon+Brigade combination (treatment 4), it appeared to be the fourth best rotation limiting the population build up to 54%. Untreated control and Assail 70 WP had the highest lygus numbers with 383% and 1083% increase, respectively. 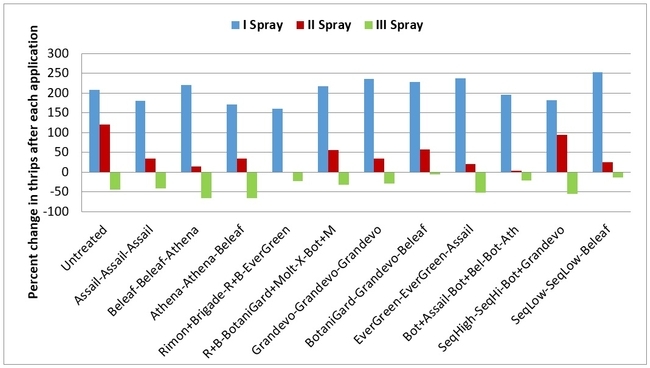 Percent change in all stages of lygus bugs after three spray applications. 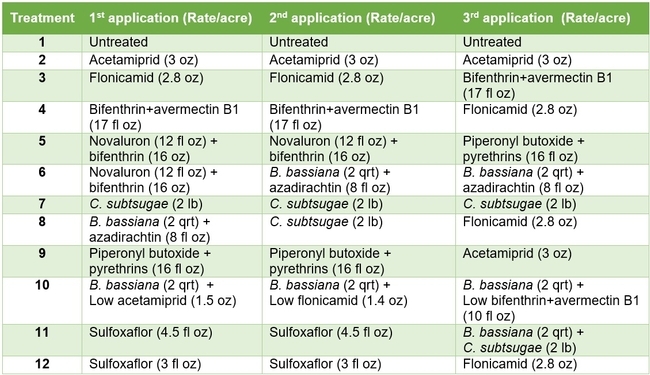 Treatments ranked according to their efficacy as expressed by the percent change/control of lygus bugs after three spray applications. Thrips:There was a general reduction in thrips numbers post-treatment. There was a 48% reduction in their post-treatment numbers in untreated control while it varied from 35% treatment 2 to 68% in treatment 12. 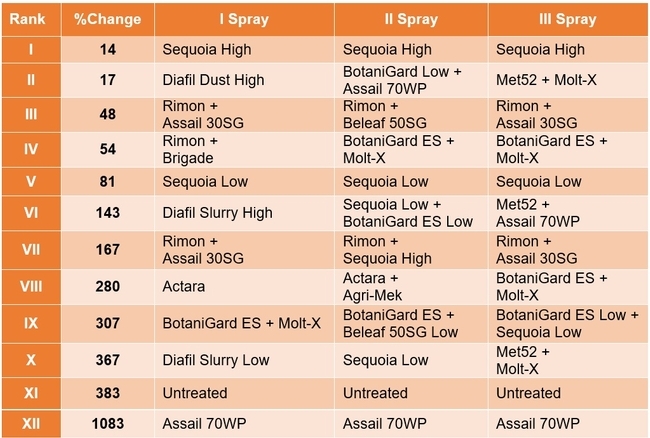 Percent change in western flower thrips populations after three spray applications. 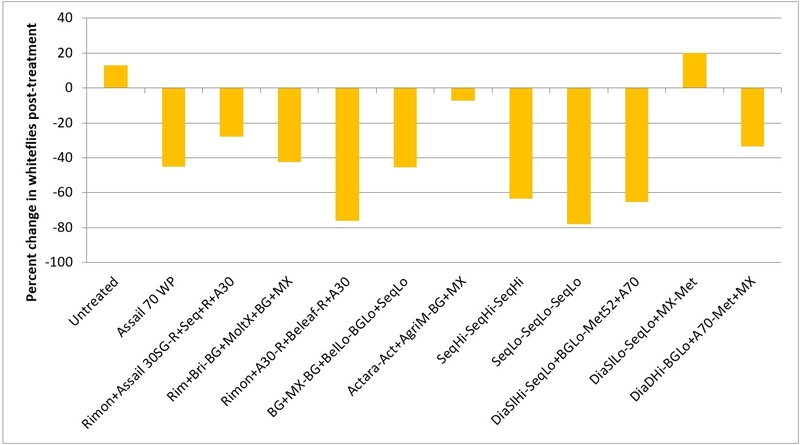 Whitefly adult:Most of the treatments reduced whitefly populations except for one treatment where there was a 20% increase (treatment 11 – Diafil low rate followed by Sequoia low rate+Molt-X, and Met 52) compared to a 13% in untreated control. There was a 7 to 78% reduction in whitefly populations in all other treatments. Percent change in greenhouse whitefly adult populations after three spray applications. Natural enemy complex:The number of big-eyed bug, parasitoids, and spiders significantly varied among various treatments post-treatment (P < 0.05, data not shown). When the percent change was considered for the entire natural enemy complex, there was a reduction in all treatments with 41% reduction in untreated control and 53-86% reduction in various treatments. Diafil application left a white deposit on strawberry plants for several days making the berries unmarketable. It may not be practical for managing lygus bug, which usually appears after fruit production starts. These results support last year's data in demonstrating the potential of non-chemical alternatives such as microbial and botanical pesticides. These tools are essential for sustainable pest management and can make a significant reduction in chemical pesticide use without compromising the control efficacy. California Department of Pesticide Regulation. 2014. Summary of pesticide use report data 2012: Indexed by commodity. Dara, S. K. 2014. New strawberry IPM studies with chemical, botanical, and microbial solutions. CAPCA Adviser 17: 35-37. National Agricultural Statistics Service (NASS) 2013. California agricultural statistics: 2012 crop year. The western tarnished plant bug or lygus bug (Lygus hesperus), the western flower thrips (Frankliniella occidentalis), the greenhouse whitefly (Trialeurodes vaporariorum), and the strawberry aphid (Chaetosiphon fragaefolii) are important insect pests of strawberries in California (Zalom et al., 2014). While the importance of thrips and whitefly fluctuates from year to year, lygus bug continues to be a major problem in strawberries. 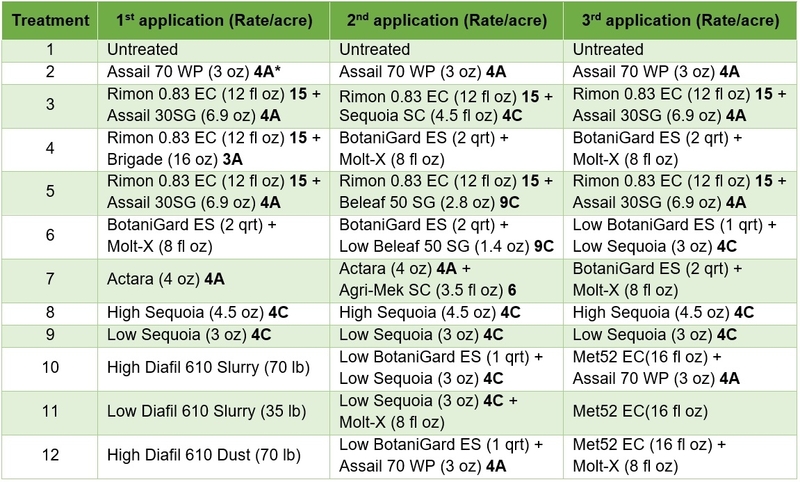 Changing pest conditions have a potential for increased pesticide applications and possible resistance issues. There is a need to emphasize the importance of integrated pest management and explore alternatives to chemical pesticides. Previous field studies in Santa Maria demonstrated the potential of azadirachtin and the entomopathogenic fungus, Beauveria bassiana for managing strawberry pests, particularly the lygus bug when used as standalone treatments or in combination of other materials (Dara, 2013). Additional studies conducted in Santa Maria evaluated azadirachtin, B. bassiana, a biopesticide based on Chromobaterium subtsugae,and existing and newly registered chemicals in a rotation program. The objectives of this study were to determine the efficacy of new chemicals against lygus bug and to identify treatment combinations where good pest control can be achieved with non-chemical alternatives or reduced rates of chemicals. A large plot field study was conducted on strawberry variety, Virtue at Manzanita Berry Farms in Santa Maria which was planted on October 20, 2012. 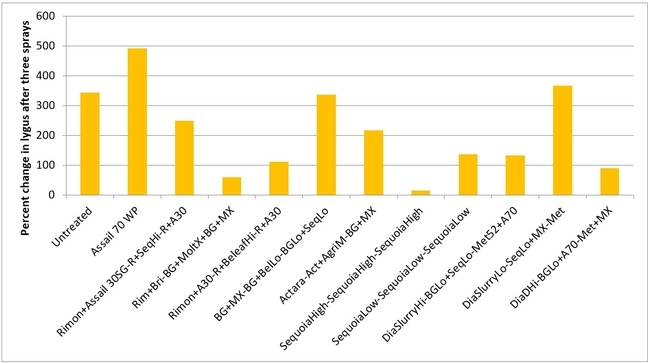 Existing and newly registered chemical active ingredients such as acetamiprid (Assail), bifenthrin (Brigade), bifenthrin+avermectin (Athena), flonicamid (Beleaf), novaluron (Rimon), piperonyl butoxide+pyrethrins (EverGreen), and sulfoxaflor (Sequoia) were evaluated along with non-chemical alternatives such as azadirachtin (Molt-X), B. bassiana (BotaniGard), and Chromobacterium subtsugae (strain PRAA4-I) (Grandevo) in a rotation program (Tables 1 and 2). Acetamiprid was used as a grower standard along with an untreated control. Although B. bassiana is infective to all life stages, some immature stages might escape infection by getting rid of the attached conidia during molting. The combination of azadirachtin and B. bassiana target immatures and adults, respectively, and could be compared to the combination of novaluron and bifenthrin. Using the lowest label rates of chemical active ingredients along with B. bassiana was intended to reduce the use of chemicals without compromising the control efficacy. Each treatment included seven 75' X 68” long beds replicated four times and arranged in a randomized complete block design. Treatments were applied by the grower using tractor-mounted spray equipment at 50 gallons per acre on 14, 22, and 29 May, 2013. The first application was made late afternoon and the remaining two during early morning hours. Non-ionic surfactant was used at 0.125% concentration for treatments that included B. bassiana and at 0.25% for all other treatments. Insect and natural enemy populations were monitored 5 or 6 days after each treatment by sampling 20 random plants in the middle three beds of each plot. Sample plants were gently beaten with the lid of a plastic container to dislodge arthropods and the number of aphids, lygus bugs, thrips, whiteflies, and various species of natural enemies in the container was counted. Natural enemies that were observed during the period included bigeyed bug (Geocoris spp. ), minute pirate bug (Orius spp. ), lacewing (Chrysoperla spp. and Chrysopa spp. ), damsel bug (Nabis spp. ), lady beetle (multiple species), parasitoids (multiple species), and spiders (multiple species). Data were analyzed using ANOVA and significant means were separated using Tukey's HSD test. 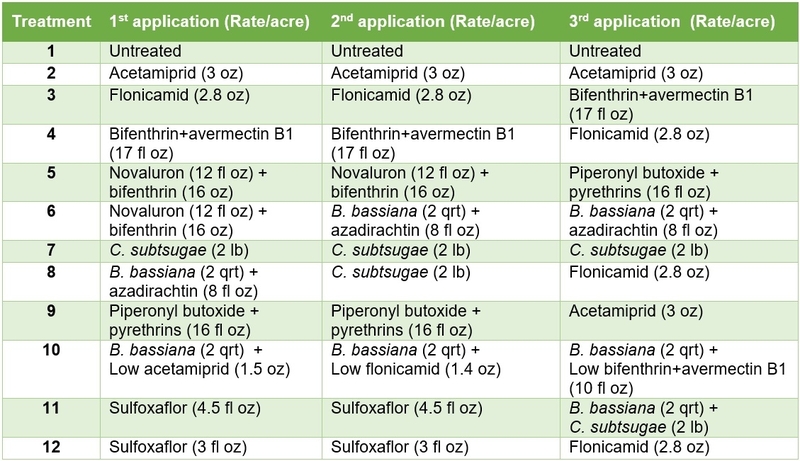 Treatments varied in their efficacy against different pests when individual sampling dates (data not showed) and average for three sampling dates were considered (Table 3). Aphids: Very low numbers of aphid infestations occurred during the study period. 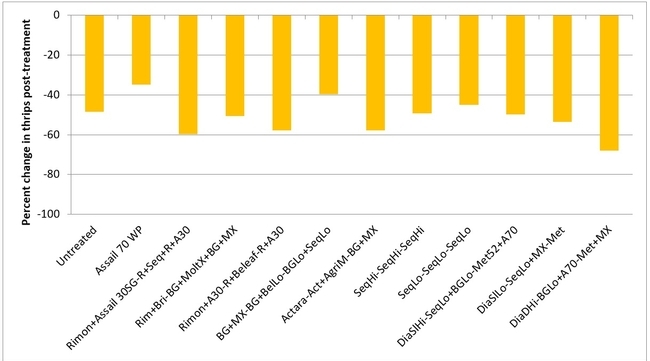 Average number varied from 0 to 0.33/20 plants during the post-treatment period, but there was no statistically significant difference among different treatments (P > 0.05, data not shown). 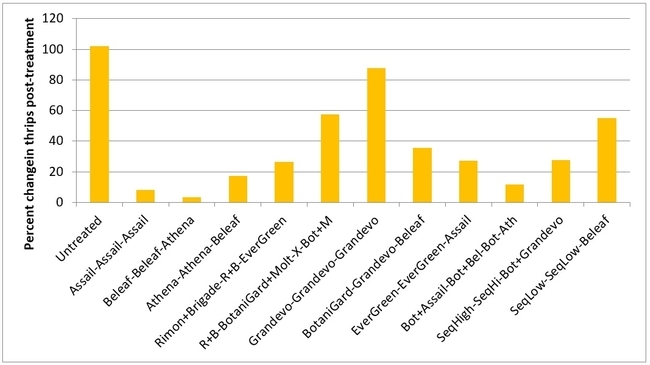 Lygus bug:Lygus numbers were more or less similar initially and significant differences were seen after the 2nd and 3rd spray applications (P < 0.01). 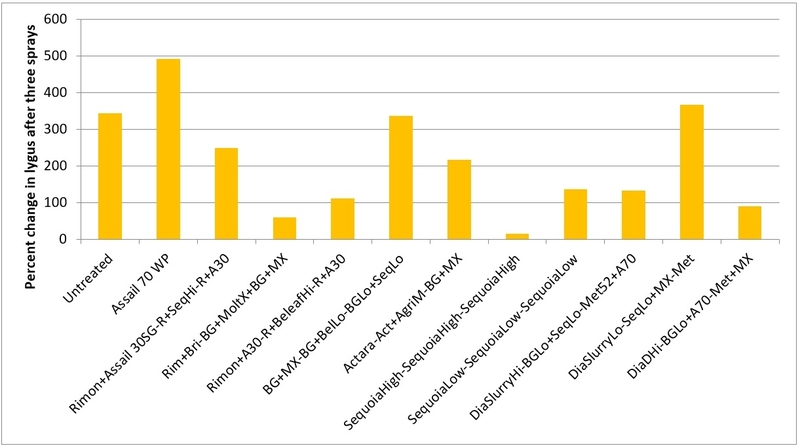 When the average for nymphal and adult stages for post-treatment period was considered, the lowest number was found in treatment 5 (two sprays of Rimon and Brigade followed by EverGreen) and treatment 10 (low rates of Assail, Beleaf, and Athena with BotaniGard) followed by treatments 11 (Sequoia at high rate, BotaniGard, and Grandevo) and 6 (Rimon+Brigade followed by two sprays of BotaniGard+Molt-X). The highest numbers were seen in untreated control and plots treated with Grandevo alone. 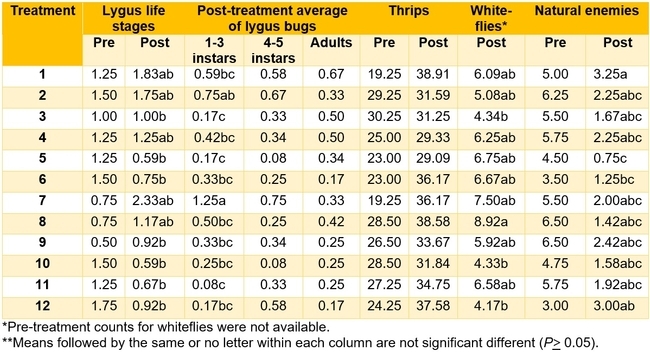 When individual life stages were considered, there were no statistically significant differences in the number of 4th and 5th instar nymphs and adults post-treatment (P > 0.05). 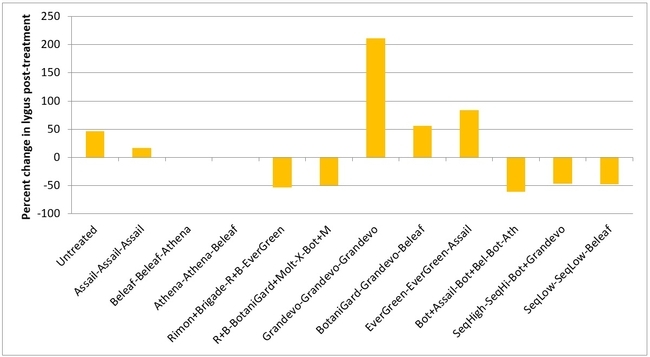 However, treatments 11, 5, 3 (two sprays of Beleaf followed by Athena), and 12 (two sprays of Sequoia at low rate followed by Beleaf) had the lowest number of 1st to 3rd instar nymphs (P < 0.0001). 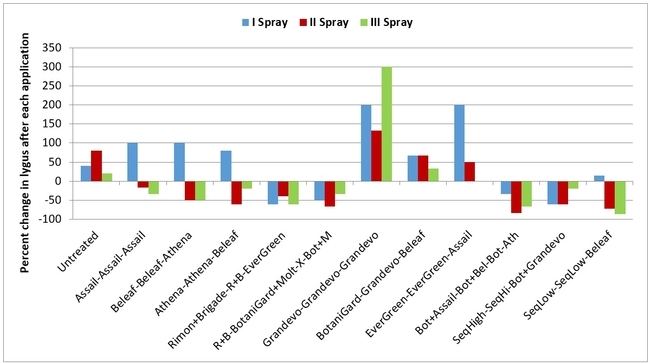 When change in lygus populations as a result of treatments was considered, numbers increased in untreated control, treatments 7 (Grandevo), 8 (BotaniGard, Grandevo, and Beleaf), and 9 (two sprays of EverGreen followed by Assail). 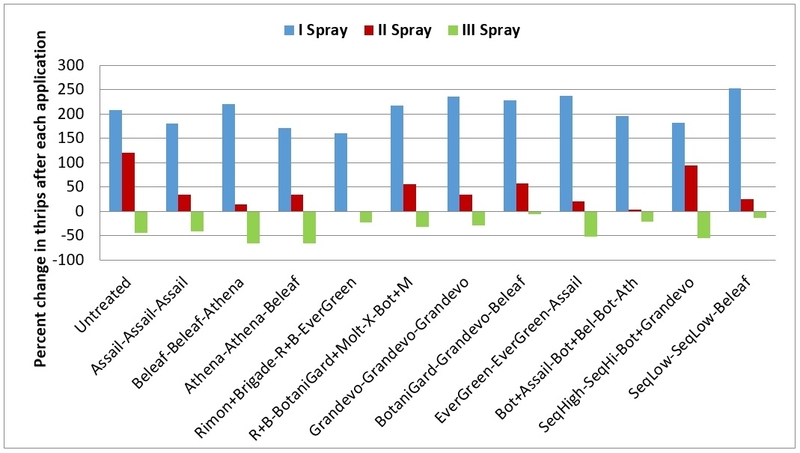 Following an increase after the first application, reduction in populations was seen in treatments 2 (Assail), 3, 4 (two sprays of Athena followed by Beleaf), and 12 after subsequent applications. Thrips:There was an increase in western flower thrips numbers after the first spray application. Treatments appeared to show their effect following the second application where the increase was limited. However, there was a general decline in their numbers in all plots after the third application. Number of thrips varied from 29 to 39 per 20 plants for post-treatment averages, but they were not statistically significant (P > 0.05). Whiteflies: Low numbers of whiteflies were observed during the observation period. Pre-treatment whitefly counts were not available, but the number of adults for post-treatment period varied significantly among treatments (P = 0.03). The lowest number of whiteflies was seen in treatments 3, 10, and 12. Natural enemies:There was a general decline in natural enemy populations in all plots after treatments were administered. Although highest numbers were seen in untreated control (P = 0.002), there was no specific trend on specific treatments that could be detrimental or beneficial to natural enemies. This study showed the efficacy of several active ingredients against the primary target, lygus bug and other pest populations. 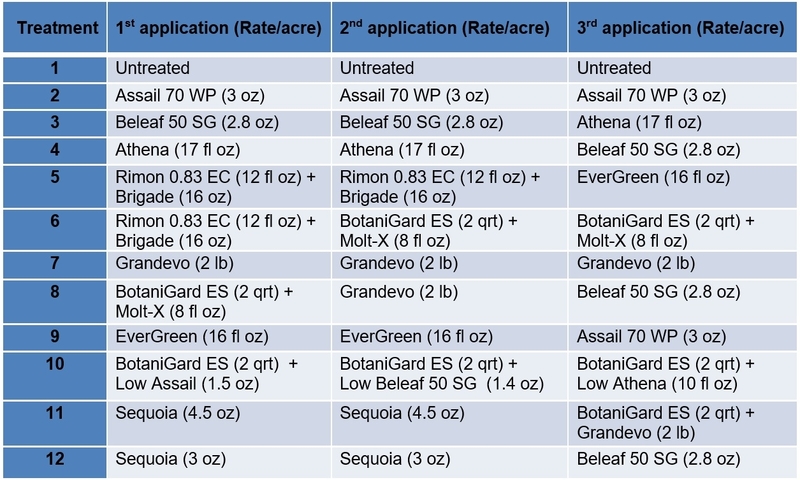 Most of the treatments were effective in reducing lygus populations except for those that had Grandevo alone (treatment 7), BotaniGard+Molt-X followed by Grandevo, and Beleaf (treatment 8), and two EverGreen sprays followed by Assail (treatment 9). Substituting the combination of Rimon and Brigade combination with Molt-X and BotaniGardappeared to be an environmentally safe, but effective strategy to achieve good lygus control. 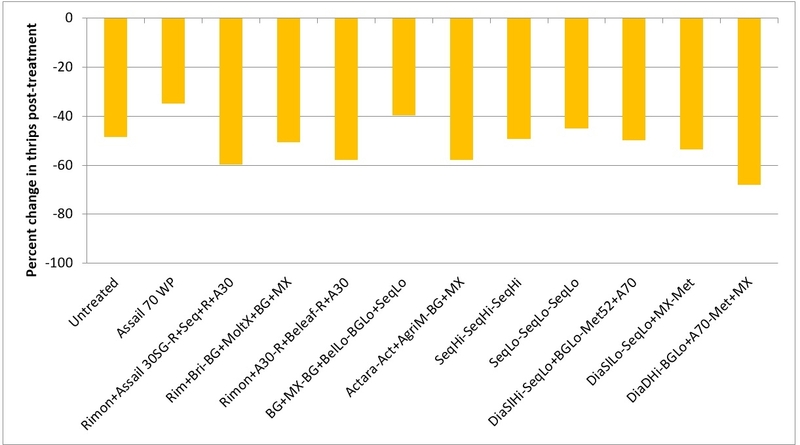 Similarly, using reduced rates of Assail, Beleaf, and Athena with BotaniGard (treatment 10) also appeared to provide good control. Such non-chemical alternatives serve as an important part of resistance management and integrated pest management. 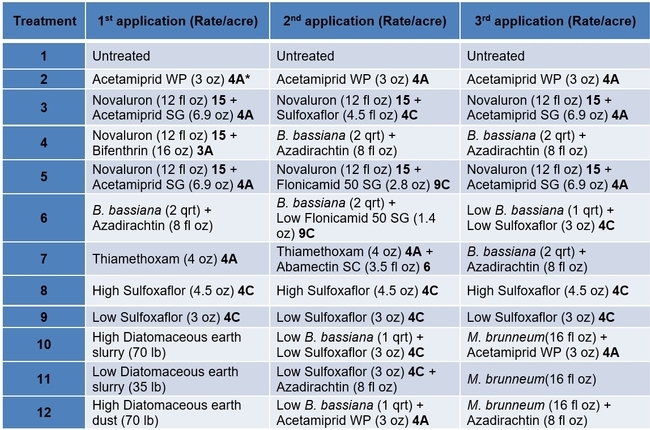 Important aspects of insect resistance management addressed by this study include i) reducing the total number of chemical insecticide applications, ii) using lower rates of chemical pesticides, iii) rotating different modes of action, and iv) incorporating non-chemical alternatives. This study demonstrates the efficacy of existing and new chemistries as well as the potential of botanical and microbial control options for lygus bug management in strawberries. These results also underscore the role of non-chemical alternatives beyond organic agriculture and their potential in conventional cropping systems. Acknowldegments: Thanks to Dave Peck, Manzanita Berry Farms for the collaboration and to the pesticide industry partners for funding the study. Thanks to Chris Martinez, Jacob Conway, and Maria Murrietta for their technical assistance. Dara, S. 2013. Microbial control as an important component of strawberry IPM. February issue of CAPCA Adviser magazine. Zalom, F. G., M. P. Bolda, S. K. Dara, and S. Joseph (Insects and Mites). 2014. UC IPM Pest Management Guidelines: Strawberry. University of California Statewide Integrated Pest Management Program. Oakland: UC ANR Publication 3468. June, 2014.